Named after Cesena physician and senator Maurizio Bufalini (1787–1875), the city’s public hospital is a facility with numerous areas of excellence that make it a landmark in the region and the country as a whole. The renovation of four ordinary wards conducted by architect Andrea Gozzoli of the Romagna public health unit’s building design and development office aimed to improve users’ comfort with better hospital interiors. The project was carried out in close partnership with Iris Ceramica, which supplied floor and wall coverings from the French Wood collection, produced using ACTIVE technology, selected on the basis of their aesthetic qualities and sanitising properties. Bufalini Hospital is run by the Romagna public health unit, the territory of which coincides with the three provinces of Forlì-Cesena, Rimini and Ravenna, where there are 13 hospitals. The four wards involved in the project are the same age as the building, inaugurated in 1962 in the presence of then Prime Minister Amintore Fanfani. The demands of today’s healthcare system required modernisation of the building and service areas, providing a level of comfort comparable to that of a hotel, with rooms containing only two beds each and their own private disabled-accessible toilet. The project demanded high-quality attractive finishes, for the patients’ rooms were to have a comfortable, home-like feel to help people get through what is naturally a difficult time in their lives. 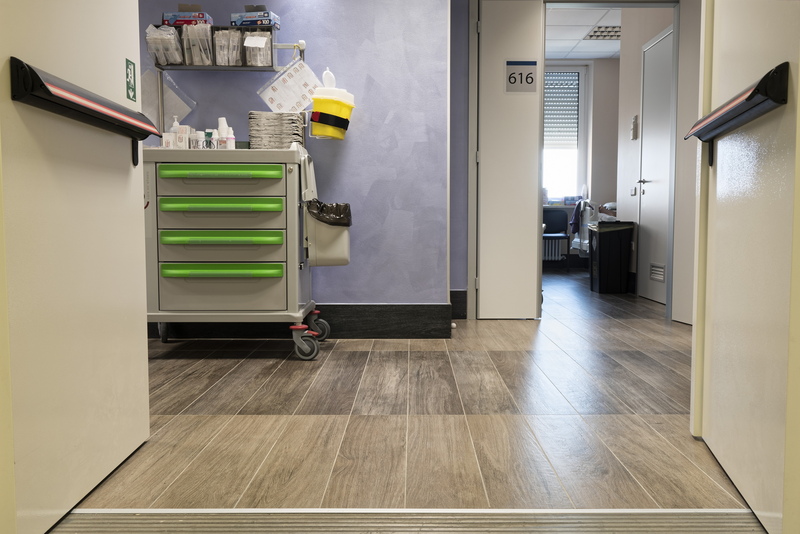 The focus is therefore not only on ergonomic, functional design of space, pathways, climate control and building automation, but improvement of the surfaces visible to and in direct contact with the patients. This is why such great care was taken in the choice of surface coverings in the renovation project at Bufalini hospital. The contractor proposed Iris Ceramica ACTIVE slabs from the French Wood Collection, reproducing the look of natural wood in 120x20 cm strips in three colours (Larch, Elm, Ebony) out of the six shades available in the series. The material stands out for its antibacterial properties: the results of tests conducted in the Chemistry Department of Milan University on ceramic slabs made using this production technology reveal an effective permanent action fighting indoor pollution, eliminating the nano-particles present in the air, including NOx, and above all an effective antibacterial action capable of eliminating bacteria of all kinds, from the most common to antibiotic-resistant strains. To these benefits we may add its self-cleaning properties permitting easier, less expensive cleaning of ceramic surfaces with water alone, doing away with the use of frequently toxic or polluting chemical cleaning products. The ACTIVE French Wood Collection offers all the strength of porcelain with the pleasing, reassuring look of natural wood, with visible knots and veins creating a time-worn look that evokes a story, a spatial identity and a sense of belonging. In-depth study of the floor and wall surfaces, composed on the basis of the project’s multi-coloured architectural laying scheme, improved the overall look of the hospital rooms and corridors. Patients now enjoy greater comfort, making the hospital a more welcoming place, up to the standards of today’s new healthcare facilities.